I have been an athlete most of my life and an avid runner for over 40 years. I was one of those people who would run 3-4 miles a day (most days) and that would be my workout. One thing I did not do during all of those years was pay attention to my diet. Even though I stayed active my weight slowly crept up to 225 pounds. One day, I decided that I'd had enough and decided to make a serious, "life lasting", change. My mother always said, "it's not a diet, it's a live it." As a loyal Biggest Loser fan I would watch all of the contestants work their butts off and lose weight like crazy. I would think, "what are they doing that I'm not?" Well, I decided to buy Jillian Michael's book, Winning By Losing. Jillian was one of the trainers on the Biggest Loser. Reading this book and following her advice helped me shed many pounds. Along the weight loss route I picked up on P90X. Both of these programs helped me drop 60 pounds going from 225 to 165. That was a big success. Still, I wanted more. I would watch the Chicago Marathon every year. One day, the thought occurred to me, "why don't you sign up for the marathon." I thought about this for a while, worried what others would think, and was very tentative to take that all important "first step." Finally, I took that big step and signed up for the 2007 Chicago Marathon with my wife, Beth. Training for this marathon was a major achievement in itself. My usual running mileage was replaced by some serious mileage. For example, my first weekend long run was 8 miles. Yikes. Well, as training progressed the miles only increased. I fell in love with the whole training journey. Finally, marathon day came and it ended up being one of the hottest marathon days in Chicago Marathon history and the race was cancelled mid way through. My wife and I had made it to a point on the course where we were allowed to finish, if we walked. Walked we did and received our finisher medals. I was hooked and would run this race every year since (10 times) and have qualified for the Boston Marathon 8 times and ran the race 7 consecutive years. 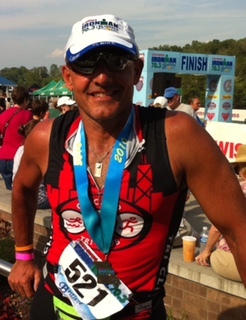 The success with marathons led me to triathlons and I have successfully finished numerous olympic, 70.3, and Ironman distance events. With my self confidence high and my love for endurance sports I have also finished several ultra marathons. What do all of these achievements have in common? I took the all important, FIRST STEP! I was brave enough to sign up for the events and then train. Taking that first step is so important. Without it, where would I be? I honestly don't know. But, I did take it and look where that first signing up for the 2007 Chicago Marathon has led me. I'm so thankful and this is why I became a coach. I want to help others take that all important, FIRST STEP, and realize they can accomplish so much more than they ever thought. Let's do this!